Trendy Twine - Mr. & Mrs. I created a card and gift holder for the bride and groom. We purchased the bride and groom a champagne brunch for one of their honeymoon days. Their honeymoon registry was online and you just simply select the gift and the hotel sets up the gifts and activities for them. I thought it was so awesome! I just printed the certificate and placed it inside the box. 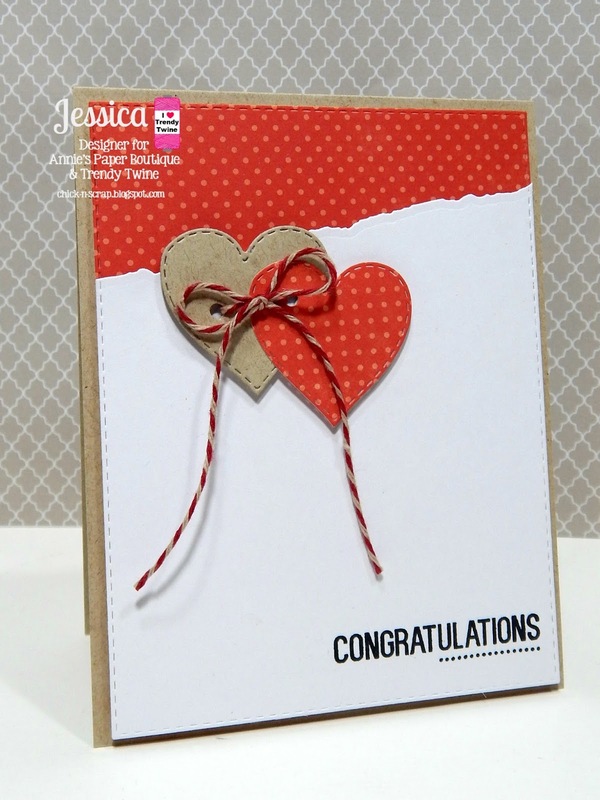 I used a very simple design for the card and more die cuts and Krafty Red Trendy Twine. I love the pattern paper and the bold red. Hope the happy couple enjoys it. Stop by the Boutique and grab these goodies to make your own wedding treats! Good morning my crafty friends! 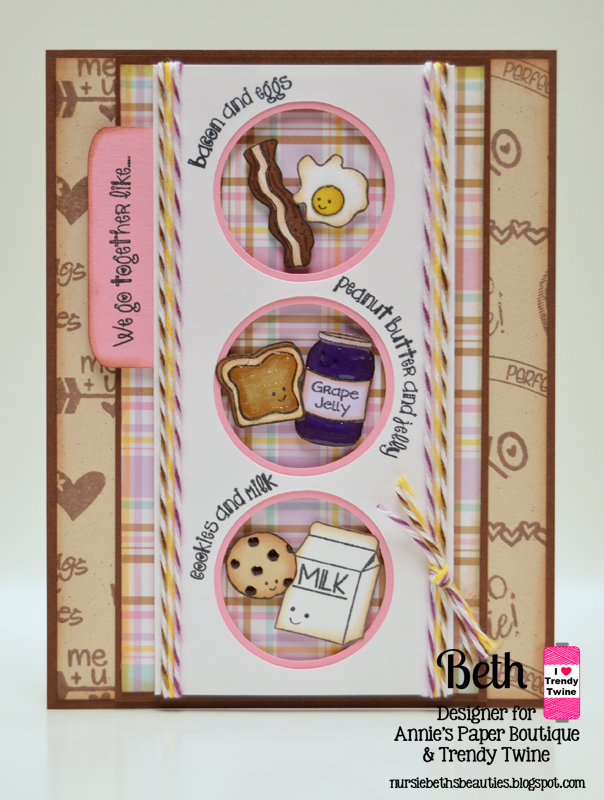 Beth from Beth's Beauties with you today to share my latest project using products from Annie's Paper Boutique. I re-purposed a mason jar that I had sitting on my counter just *begging* for me to decorate! I went with a Love theme that is perfect for an anniversary, to give to kids or to just tell someone that you care about them. I used a lot of Krafty Red Trendy Twine on this. I wrapped it around the band of burlap and lace, plus I used it to hang the felt heart and key around the shoulder of the jar. It matched perfectly with the color scheme! The sentiment stamp is from Paper Sweeties. 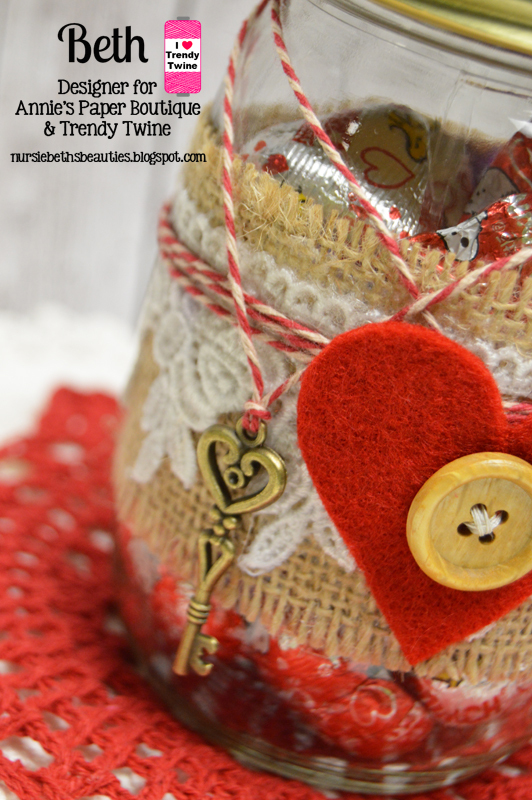 On the top of the jar, I added a circle of burlap, a die cut doily and a heart that I crocheted out of the Krafty Red Trendy Twine. Stop by my blog for the link to the pattern I used to make the heart. 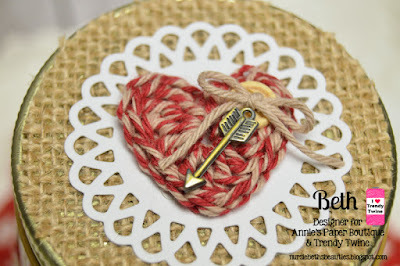 To embellish the heart, I added a tiny wood button, arrow, and a bow of Totally Kraft Trendy Twine. 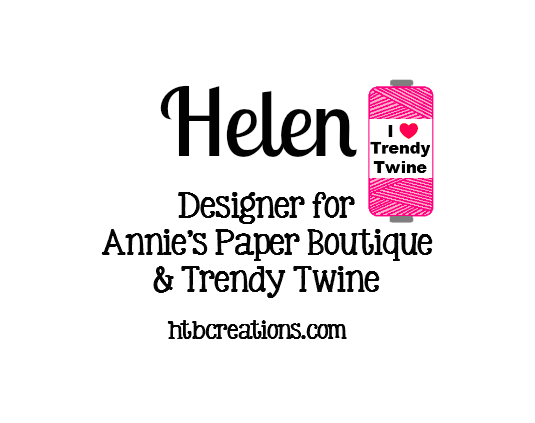 Hi, I am Amanda from She's Eclectic and I was here on the Trendy Twine blog a couple of weeks ago to tell you about some new products from Annie's Paper Boutique. Today I am back to show you how I used the new stamp sets on my planner pages! I love using stamps in my planner, I think the functional ones look nice and tidy and the decorative stamps add a touch of fun to my pages. I use the School Days, Check It Off and At Home sets every week for my to do lists and reminders, between them they cover all of my planning needs! I have been focusing on my health this year, I am using a fitness band to track how far I walk each day and my workouts and I am also trying to drink more water. I said in my last post that I had used the strip of hearts stamp from the You & Me set to record each glass of water I drank a day and I have carried on doing this for the last couple of weeks. I haven't managed to drink seven glasses in a day yet but I am trying, hopefully one day I will manage the recommend eight glasses without too much effort! As you can see I used the Perfect Pairs set to decorate my pages. I was going to leave them as just images stamped in pink but then my pencil crayons were calling out to me so I coloured them in when I had a few quiet minutes at home. Although my pages look quite full it is still really easy for me to see what I need to do and remember even with the decoration, having my lists on the left of the page and my reminders on the right keeps things simple for me. I would love to hear what your planning tips are, please let me know in the comments! I will be back next month for another Planner Friday, I hope to see you then! 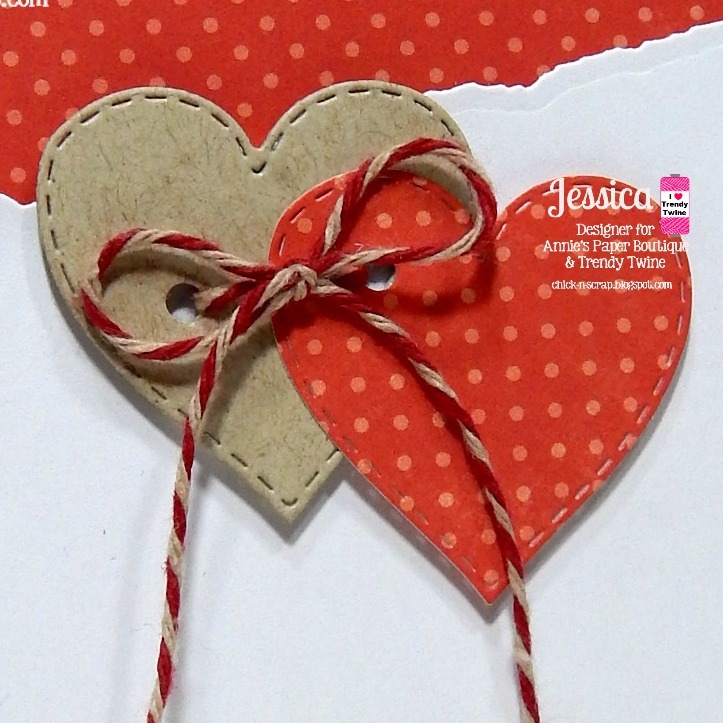 This is Shelly from My Paper Love sharing a fun Anniversary card showcasing Krafty Red Trendy Twine. Our wedding anniversary is in March (17 years :)) so I wanted to make a card for the hubs. Let me tell you... He is a good reason to be happy :) I wanted a bright and happy card so I always think of yellow as a bright and happy color. I trimmed the edge of some printed card stock with Krafty Red Trendy Twine. I love this color combo, I thought it looked nice together. I stamped a Happy sentiment from My Creative Time and adhered it to the Yellow gingham paper. I thought the card needed one last touch so I added a double kraft red bow! Don't forget this is the last week we are showcasing Krafty Red Trendy Twine so stop by the blog and get inspired! I went with a Clean & Simple card for today's post that would be perfect as a wedding card. I started with a kraft card stock base and then added a layer of designer paper from Echo Park. Continuing along, I added another layer of white card stock but this time I die cut an edge off so the fun pattern paper could be seen underneath. I stamped the sentiment onto the bottom corner and they placed the card aside to begin working on the focal point of my card. For the focal point I wanted to join the 2 die cut hearts using the Krafty Red Trendy Twine. I took the 2 hearts and taped them together. Then using my hole punch, I added 2 holes to string the twine through. A simple bow tied and the tails hung longer finished my heart piece. I popped the whole heart embellishment up onto the card front using some fun foam. Hello! I'm Helen from HTB Creations. For today's post, I made a shaker card using the fabulous Krafty Red Trendy Twine. To start, I die cut the heart onto the red card front. Next, I glued my Krafty Red Trendy Twine around the heart. Then I stamped my sentiment on the bottom. I used some red sequins, heart glitter and chunky glitter for my shaker pieces. The chunky glitter tends to stick to my plastic, but I still do like it. I keep trying to powder the plastic in hopes this won't happen, but no luck yet. After taping down my card front on top of the sequin mix, I added a twine bow, some small gold sequins, and I added some Wink of Stella clear to the sentiment. You can't see it, but it does sparkle. Be sure to stop by Annie's Paper Boutique and check out all the fun crafty goodies you can buy! 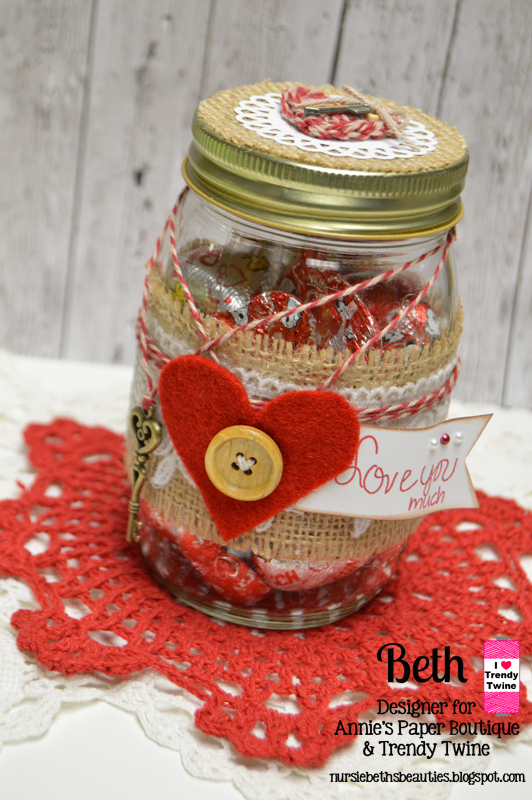 It's Millie, from Crafting with Creative M with this month's Krafty Red Trendy Twine along with the Kraft Tags With Metal Rim. Here is what I created.....A sweet treat for you! It can be given as a party favor for either a birthday, wedding or even just to show someone how much you appreciate them. For my topper, I used circles, a scallop circle and a banner die cut which are all from the Cricut Explore DS. I wrapped a strip of the Krafty Red Trendy Twine on the inside of the Kraft Tag with Metal Rim and stamped the sentiment "For You". I added a few rhinestones for a little bling. I made & tied a bow with the Krafty Red twine and adhered it to a piece of red ribbon. Then, I cut strips of the Kraft Chevron Favor Bag and used them to wrap my Hershey Chocolate Nuggets. Yummy! I placed little heart stickers to each nugget for extra cuteness and then I placed them inside a Medium Candy Bag. I then used my ATG to adhere the topper to the candy bag. Sweet, right? Here is a closer look at the pretty topper with the Krafty Red Trendy Twine. Hello everyone! This is Sukie with a single page layout to share featuring Krafty Red Trendy Twine and a Kraft Metal Rim Tag. This color is such a gorgeous combination of kraft and red, it looks amazing! I created my layout using the Gilded Paper Stack from DCWV. I love the gold in this paper stack and have been hoarding it for quite some time. The pretty doily in the background was cut from the Edge to Edge cartridge using my Cricut Explore. I just love how intricate and pretty it is. I added a Kraft Metal Rim Tag to the center of the layout and accented it with the twine. 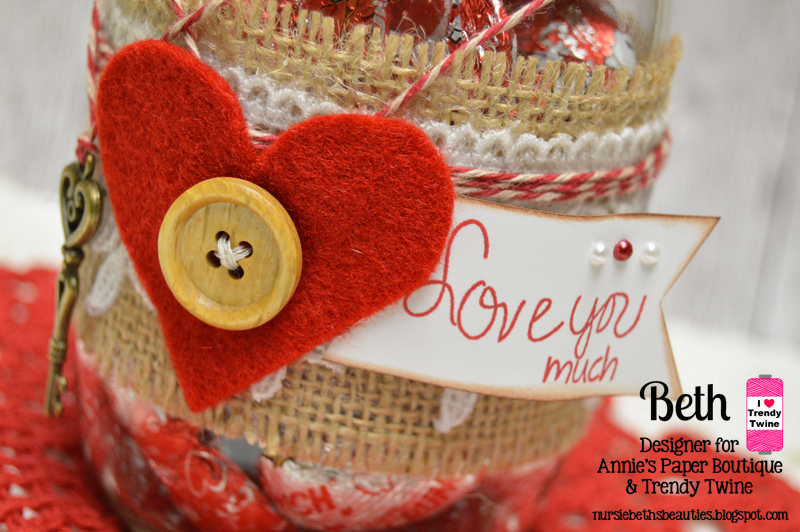 The heart in the center of the tag was cut from my new Die Versions "Wee Petite Buttons" die. More twine was used to accent my layout. The finishing touch was a few sparkly hearts. Thanks so much for stopping by! 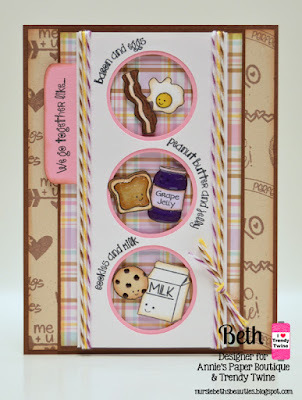 Head on over to Annie's Paper Boutique to check out the crafty products used on my layout! Have a fabulous day! Happy Love Day to all of our Trendy Twine friends! Today is a special treat for you because you get to see the work of three DT sisters. They have used the three BRAND NEW planner stamp sets that were recently released in the Annie's Paper Boutique store. These stamps were designed for using in planners, but are so verstaile that crafters of all kinds can use them. These sets also happen to work great for Valentine's Day, Anniversaries and many other occasions. Without further ado, here are the projects! Tammy, from Creating Somewhere Under The Sun! I can't believe that Valentin's Day is tomorrow. It seems like I was just writing the Happy New Year post yesterday. 2016 is already flying right along. I have a treat featuring Krafy Red Trendy Twine and Skinny Candy Bags. I filled the bags with some M & M's. I created a layered tag and die-cut a heart in the center. I just went back and forth with the Krafy Red Trendy Twine behind the heart window. It really does look amazing and makes your tags and treats extra special. 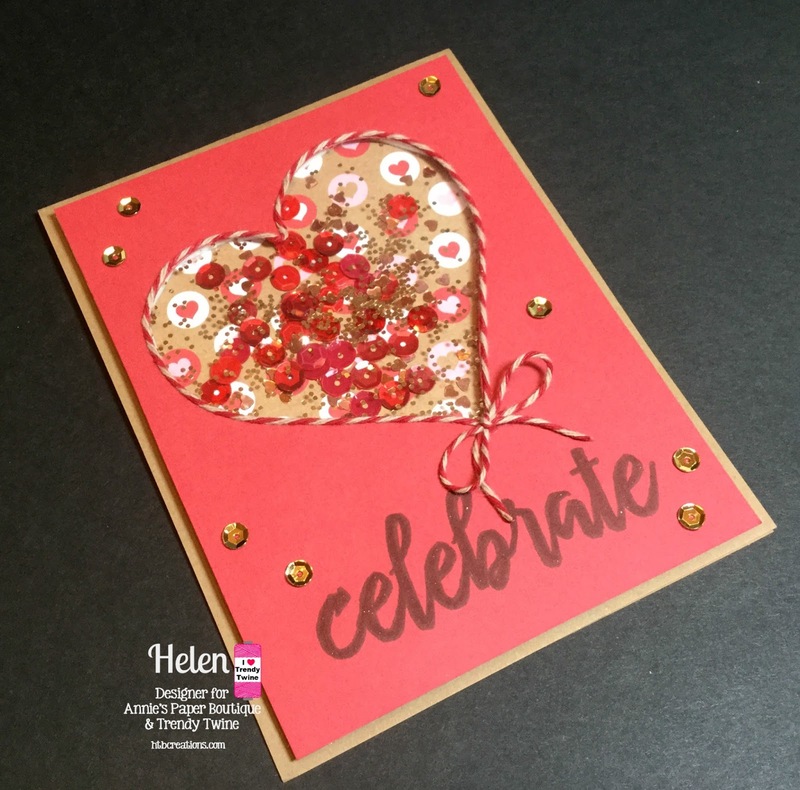 I stamped a Valentine greeting in the lower right corner and added a few sequins for a touch of glam. I punched a hole through the bag to attach it to the top using more Krafy Red Trendy Twine and tied off in a bow. Annie's Paper Boutique have some fabulous new products that I want to share with you today! 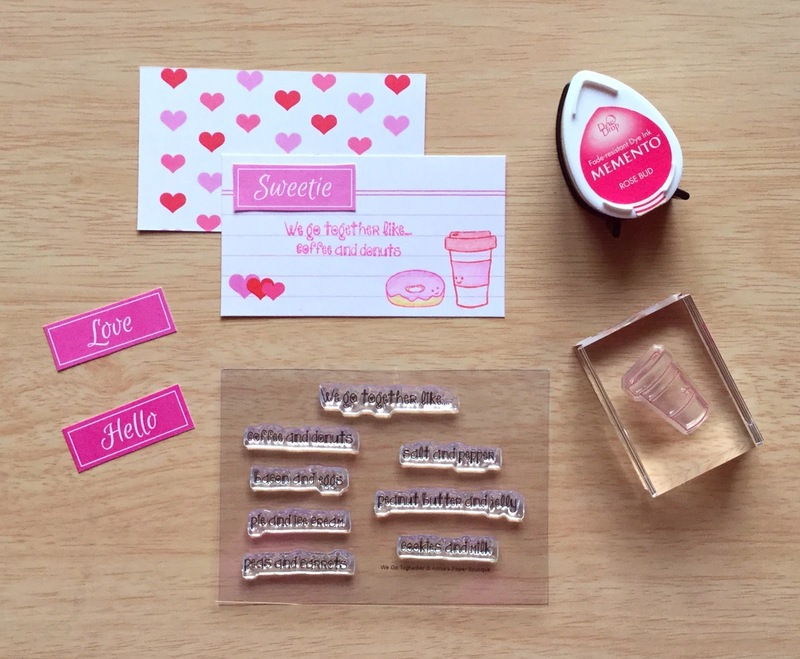 There are three fun stamp sets, a cute set of mini index cards and some sweet Valentine's Day printables that you can use to make your own cards, for journalling or for decorating your planner pages. They are very versatile! Lots of lovely new products! 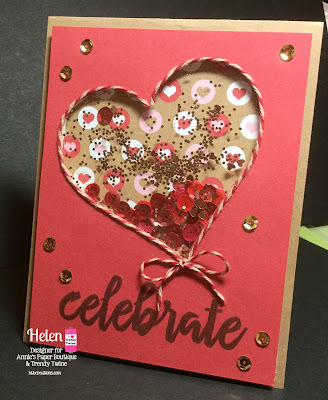 The Valentine's Day printable contains all of the cuts outs in the first photo and the Be happy today quote card, pink check print and hearts card and the pink and red To do card above. As this set is a digital download you can print off these items as many times as you like and use them again and again! The pink This week, Today, To do and Notes cards are from a new set of printables which will be available soon and they can be used as journalling cards or for reminders and to do list to help keep you organised. 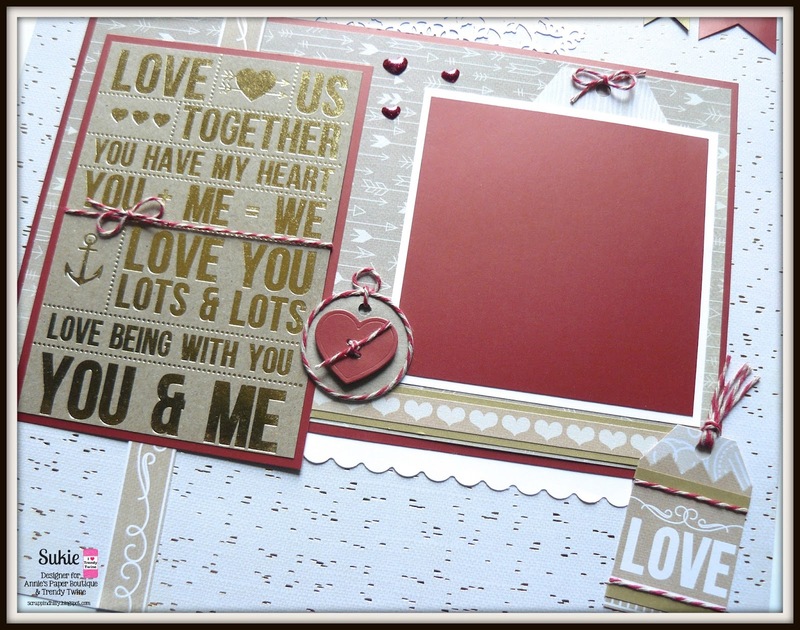 I made my own little love note for my husband using the Hearts Aflutter mini cards, Perfect Pairs planner stamp set, We Go Together planner stamp set and one of the Happy Valentines Day printables. It was very quick and easy to do! 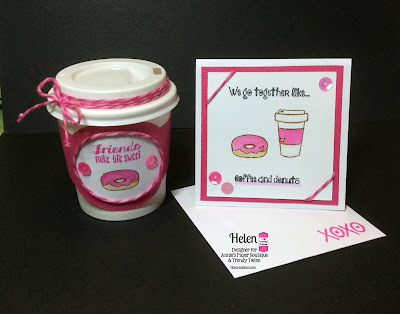 I glued the pink Sweetie cut out onto the card and then stamped the "We go together like.. " and "coffee and donuts" in the middle, I added the two image stamps in lower corner and then coloured them in. I love that the heart motif on the front of the card is carried around to the back of the card too, it looks really pretty! I am going to pop this into his lunch box along with his sandwiches as a little surprise for when he goes to eat his lunch, I hope it makes him smile. I used the heart pattern stamp from the You & Me set in my planner this week, I am using each heart to record the glasses of water I have drank through out the day, it also matches the heart Check It Off stamp I used for my to do lists which I love! I think it's great that the stamps can be used in more than one way. They can be functional or decorative, it really is up to you how you use them! Have any of the new goodies taken your fancy? Stop by the store now to pick up your favourites! I will be back again at the end of the month for Planner Friday, I hope to see you then! 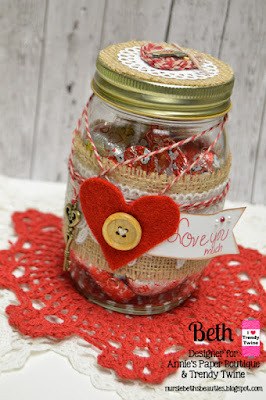 It's Millie, from Crafting with Creative M and today's project will feature the pretty Krafty Red Trendy Twine along with the Kraft Tags With Metal Rim. I made a Valentine's Day Gift Box! 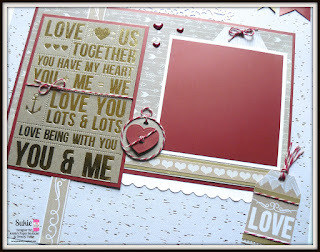 I used Valentine's Day card stock by Recollections to cover my 3x3 Kraft Box. I used Tim Holtz vintage photo distress ink around the edges. I wrapped some of the Krafty Red Trendy Twine around the top & bottom parts of the Kraft box. For the heart window shaker, I used the SU' Sweetheart punch. I used a clear acetate pocket sleeve and filled it with white beads and the red & white sequins from the Candy Cane Sequins Mix, which I absolutely love. I adhered the pocket sleeve to the inside of the Kraft box with my ATG. I then stamped "Be My Valentine" on a banner. 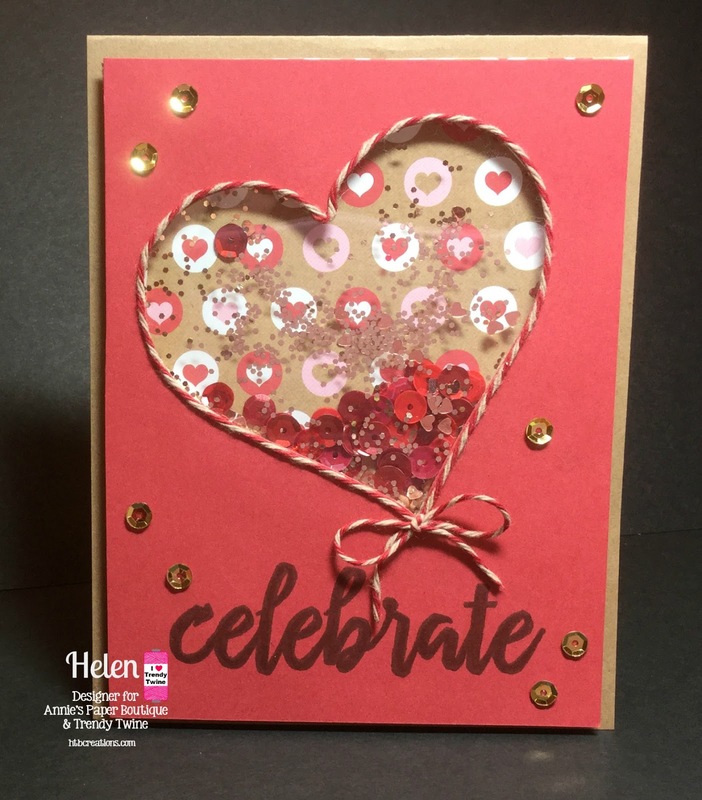 I adhered a scallop circle die cut on the center of the Kraft Tag with Metal Rim, doodled with a white gel pen, stamped "Because I love you" from Tiny Tags, added a brad and a white sticker heart. Isn't it just Pretty? 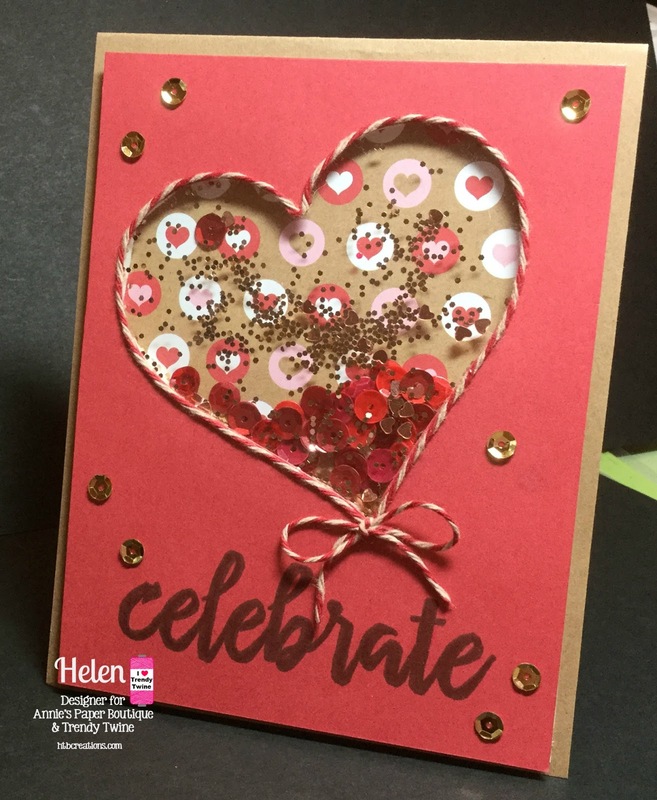 For the sides of the Kraft box I used the Scallop & Stitched Circle Die from My Creative Time and the Happy Valentine's Day Printable. For the borders, I used a scallop border punch. For the top portion of the Kraft box I made a super cute topper with a scallop circle die cut and the Bunch of Fun Circle Dies from My Creative Time. I doodled with a white gel pen and added pearl dew drops from The Robin's Nest. I wanted the tag to dangle a bit so I ran a piece of Krafty Red Twine through the Kraft tag and then adhered it to the center of the Kraft box. Then, I covered it with the super cute topper I made. 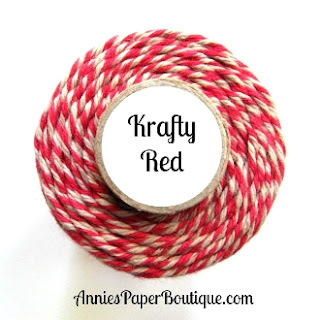 Here is a closer look at the Krafty Red Twine which I used around the shaker heart.